1) Shake the can of MARPA Pitch Cleaner Spray before use. It is also necessary to shake the can periodically while spraying. 2) Spray MARPA Pitch Cleaner directly on the stain from about 15 cm of the surface. 3) To spray MARPA Pitch Cleaner materials easier, try to hold the can vertically. Do not tilt it more than 45 degrees relative to an imaginary horizontal line. Try to keep the spray head upward. 4) After one minute, wipe the stain with a piece of soft and clean cloth. 5) If the stain still remains, repeat the above steps. Use MARPA Pitch Cleaner Spray at a good ventilated space! Avoid employing MARPA Pitch Cleaner Spray directly on surfaces that are in contact with food and drink! Do not put the can of MARPA Pitch Cleaner Spray near the front or back windshields; and keep it away from hot air outlet of the car! MARPA Pitch Cleaner Spray tin can is recycled after it is completely used up! 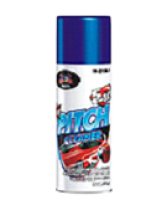 Do not puncture, bend or incinerate the container of MARPA Pitch Cleaner Spray, even after it is fully used! Keep MARPA Pitch Cleaner Spray out of reach of children and animals!